"My country, my country, my country"
a.^ Literary Arabic is the sole official language. 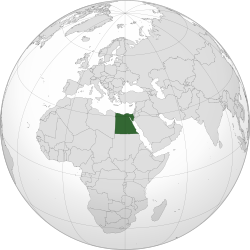 Egyptian Arabic is the national spoken language. Other dialects and minority languages are spoken regionally. b.^ Densities are based on 2006 population figures. The gap between arithmetic and real densities is due to the fact that 98% of Egyptians live on 3% of the territory. c.^ Parliament dissolved as of 11 February 2011; Supreme Council of the Armed Forces presently holds legislative power. d.^ On July 8, 2012, Egypt's new president Mohamed Morsi said that he's overriding a military edict that dissolved the country's elected parliament and calling on lawmakers back into session. ↑ "Census authorities: Egypt's population already 90 million – Politics – Egypt – Ahram Online". English.ahram.org.eg. 2012-05-03. Retrieved 2012-09-03. ↑ "Indicators From Final Results of 2006 Pop. Census Compared With 1996 Census" (PDF). Central Agency for Public Mobilization and Statistics. Retrieved 15 April 2011. ↑ ୫.୦ ୫.୧ ୫.୨ ୫.୩ "Egypt". International Monetary Fund. Retrieved 18 April 2012. ↑ de Blij, H. J.; Murphy, Alexander B.; Fouberg, Erin H. (2006). Human Geography: People, Place, and Culture (8th ed.). New York: John Wiley & Sons. p. 38. ISBN 978-0-471-67951-6. ↑ Fahmy, Mohamed. "Egypt's president calls back dissolved parliament". CNN. Retrieved 8 July 2012. Leonard William King, History of Egypt, Chaldea, Syria, Babylonia, and Assyria in the Light of Recent Discovery, Project Gutenberg. Napoleon on the Nile: Soldiers, Artists, and the Rediscovery of Egypt.